William and Francis Blight started milking cows for Floyd Starr in 1963 with help from students at Starr Commonwealth School for Boys. In March of 1965 Bill and Fran bought a 319 acre farm just west of Albion, Michigan which is currently our main cattle farm. 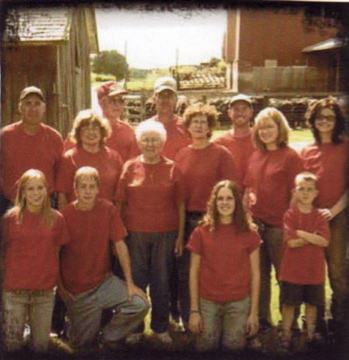 Bill and Fran worked together with their brood cow herd and grew corn, wheat and oats. Bill and Fran's eldest son, Art, returned to work on the farm full-time in 1977 and expanded the family business to include hog production. Ken joined his brother Art on the farm in 1985 and together they evolved the farm to include growing soybeans and have implemented no-till along with other conservation farming methods to become more efficient and environmentally concious producers. Stan, Bill and Fran's grandson, joined the operation in 1997. Art's youngest daughter Afton started working on the farm full-time in 2011. Today Blight Farms consists of a beef cattle herd, farrow to finish hogs, and corn, wheat, soybeans, and hay production. In 2006 we received the National Cattlemens Association Environmental Stewardship Award. This honor recognizes U.S. cattle producers who have demonstrated their sincerity in protecting the environment through conservation achievements and wildlife habitat preservation while maintaining a profitable business. To watch the video highlighting our environmental accomplishments visit YouTube. Hello, my name is Afton Blight Maksimchuk and I maintain and update the Blight Farms Inc website.In the photo I am holding a turnip and radish which have been key players in making the fall cover crop research a success on our farm. You can learn more about what that means on the Our Farm Practices page. I hope you find our website useful!